Have you ever wished you could take advantage of the energy and excitement of TRB’s Annual Meeting and exhibits to highlight the value of your organization in a theater setting? Well, now you can! 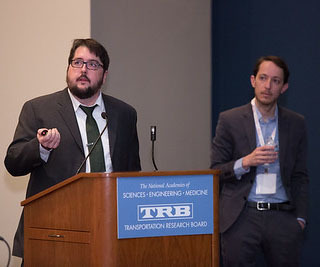 New for the TRB 98th Annual Meeting in 2019, TRB Live! theaters in the exhibit hall will give Annual Meeting exhibitors and patrons the exclusive opportunity to make 30-minute presentations on the goods, services, and solutions their organizations provide. TRB’s new TRB Live! theaters are designed to enhance the value of the TRB Annual Meeting to its supporting organizations, as well as to expand the information transfer opportunities for TRB Annual Meeting attendees. Two theaters will be open on Monday and Tuesday, January 14 and 15, 2019, during the Annual Meeting exhibits. Presentations in the TRB Live! East theater will start at the top of each hour, and presentations in the TRB Live! West theater will start at the bottom of each hour. The first presentation will start at 9:30 a.m. and the last will start at 3:00 p.m., making every presentation an exclusive experience within the hall. There will be a total of 12 slots for each day (24 total slots over two days). The investment per time slot is $500, and slots will be sold on a first-come, first-served basis. Exhibitors or Patrons may reserve up to two slots, so long as those two slots are not on the same day. Presentations that begin on the hour are in TRB Live! East. Presentations that begin on the half hour are in TRB Live! West. 1:00pm - Miovision Technologies, Inc.
2:00pm - Earthwave Technologies, Inc.
9:30am - Regional Economic Models, Inc.
TRB will list the name of the presenting organization, and the day and time of the presentation in the mobile app. If the presenter contracts for a theater slot by November 2, 2018, TRB also will list the presenter in the printed Final Program. All other promotion of a presentation is the responsibility of the organization reserving the theater slot. Presenters will have access to the theater up to 15 minutes before their presentation is scheduled to start, and they must be out no more than 15-minutes after the conclusion of their presentation. The full rules related to the use of TRB Live! theater space are available in the TRB Live! Theater Terms and Conditions. INVESTMENT PER TIME SLOT: $500 (Each will be sold on a first-come, first-served basis. Exhibitors or Patrons may reserve up to two slots, so long as those two slots are not on the same day. ).